Conservatives in Minnesota continue to push for a dramatic reduction in Minnesota’s estate tax, which would almost exclusively benefit the state’s wealthiest residents (who already enjoy below average effective tax rates). Implementing the estate tax reductions proposed by conservatives would further increase the regressivity of Minnesota’s state and local tax system. The estate tax is a tax on the transfer of wealth upon death. If the total value of the estate is larger than a specified threshold, a tax is imposed on the portion above the threshold before the remaining assets are distributed. In Minnesota, amounts given to charity or to a spouse, as well as debts, funeral expenses, and costs related to estate administration are excluded. Of the remaining “taxable estate,” the first $1.2 million was exempt from taxation in 2014; for farms and small businesses, another $3.8 million was exempt, effectively exempting $5 million for these estates. Every two years, the Minnesota Department of Revenue publishes information on the impact of the estate tax and other state and local taxes in the Minnesota Tax Incidence Study (MTIS). The 2017 MTIS examines tax information for 2014, grouping tax payments into ten equally sized groups, referred to as “deciles.” The first (or bottom) decile consists of the ten percent of households with the lowest income, while the tenth (or top) decile consists of the ten percent of households with the highest income. The tenth decile is further broken down into the “next 5%” (i.e., the bottom half of the tenth decile), the “next 4%” (i.e., the top half of the tenth decile excluding the top 1%), and the “top 1%.” The 2014 income range for each group is shown below. Based on 2014 estate tax data from the 2017 MTIS, the estate tax is borne overwhelmingly by the top one percent of Minnesota households. The reason for this is obvious: as a general rule, only extremely high-income households have accumulated enough wealth to extend above the threshold beyond which any estate tax is due. 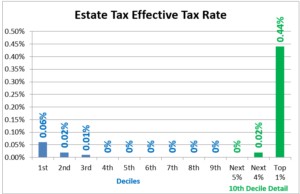 The chart below shows the estate tax effective tax rate (i.e., the estate tax as a percent of income) or ETR in 2014 for each of the income groups listed above. The fourth through ninth deciles and the bottom half of the tenth decile—encompassing incomes from $26,141 to $213,506—have an estate tax ETR of zero, indicating that virtually no households in this income range paid any estate tax. The “next 4%,” with incomes from $213,506 to $512,192, report a minimal estate tax ETR of 0.02 percent; the households in this group with a 2014 estate tax liability are almost certainly clustered toward the high end of this income range. The estate tax ETR for the top one percent—with 2014 incomes in excess of one-half million dollars—is 0.44 percent, multiple times greater than that of any other income group. Overall, however, extremely high income households still enjoy a somewhat privileged position in terms of state and local taxes. According to the MTIS, the total 2014 ETR for the top one percent based on all state and local taxes, including the estate tax, is 11.5 percent—0.5 percent below the statewide average. Without the estate tax, the ETR of these households would drop to 11.0 percent—nearly a full one percent below the statewide average. The estate tax reduces—but certainly does not eliminate—the tax advantage that extremely high-income households enjoy relative to other Minnesotans. A further dive into the MTIS data reveals that approximately 98.4 percent of the entire 2014 estate tax liability was paid by households in the top five percent, and 94.3 percent was paid by the top one percent. Even this data likely understates the extent to which payment of the current Minnesota estate tax is concentrated among high-income household. Under legislation passed in 2014,† the estate tax exemption has been increasing at the rate of $200,000 per year until a $2 million exemption is reached for deaths occurring in 2018. Because of the increasing exemption levels, the distribution of estate tax payments today is almost certainly more skewed toward high-income households than it was in 2014. Even before the estate tax reductions enacted in 2014 are fully phased-in, conservatives are seeking even more reductions to this highly progressive tax. Because estate tax payments are concentrated within a tiny sliver of the wealthiest Minnesota households, attempts to cut the estate tax would benefit these same households, and would have the effect of lowering the total state and local ETR of the top one percent of Minnesota households—which is already significantly below the statewide average—even further. The result will be a more regressive tax system, with low- and moderate-income households bearing an even larger share of total state and local taxes. The next article in this series will examine a proposal put forward by conservatives to further lower Minnesota’s estate tax by conforming to the federal estate tax exemption. *Because of the low aggregate income levels in the low-income deciles, an extremely small number of estate tax payments within these deciles could explain the entire estate tax ETR for the decile. For example, a single $1 million 2014 estate tax payment out of the 266,091 households in the first decile would be sufficient to generate the 0.06 percent estate tax ETR observed in the first decile. †The increase in the general exemption level enacted in 2014 does not affect the special exemption levels for small businesses and agricultural homesteads, which remains at $5 million.